Published an op-ed yesterday with Greentech Media on the Brooklyn-Queens Demand Management Program, as a companion to intervenor comments I filed earlier in the month (the charts in here are worth a look if you want more detail). BQDM has become a standard talking point on what NY's "REV" regulatory reform is and does. The program is more or less REV's proof of concept: "$200 million vs. $1 billion", as one environmental ngo lead put it. But that happy story isn't in the official numbers. And additional serious hiccups over the last couple months have gotten no coverage, even in recent feature articles on Con Edison's innovative programs and detailed presentations by senior policymakers. The facts in the regulatory record and on the ground with DER developers just didn't reflect these talking points. "AN EXOTIC PAYDAY LOAN"? Forecast annual revenue requirements 2014-2075F for BQDM and its traditional substation alternative. It may risky or even dumb to speak out against programs that promote distributed energy (this company's bailiwick). But I have to believe a more engaged policy dialogue will improve our chances at making NY's electricity system sustainable and a real example for other states, other megacities, the world. Thanks so much to Julia Pyper and Stephen Lacey at Greentech Media, who took time to understand the issue and get the piece out there; brilliant friends for their thoughtful notes on the piece; and readers who have already sent back great, engaged feedback. Had a blast helping NY Times explanation virtuosa Emily Rueb with her latest NY 101 piece, tracking NYC's electricity from turbine to socket. It's a lucid, brilliantly written piece with neat and informative illustrations, and you should read it right now over at the Times. Getting to work where you live, deliver projects that bring the benefits of distributed energy to working families, and collaborate with bright, inspiring, forward thinking clients and counterparts to creatively overcome financing hurdles are all potential perks of Peak Power's mission. Getting them all in the same deal is really sweet. Congratulations to the good people at Zero Carbon Corporation (and Brooklyn Power), Sunset Park's Elmo Homes, and NYCEEC for making this great project happen, and rolling out a pretty exciting model for solar in the largely untapped co-operative and condominium space. Is US climate policy doomed?! Specifically: Prez-elect Trump has indicated strong climate skepticism (now personified in his transition appointee Myron Ebell). Along these lines, the press has focused particularly on Obama's Clean Power Plan, often (somewhat inaccurately) identified as his climate policy centerpiece. Because the Plan has been stayed by SCOTUS, and its rules are not yet promulgated by the EPA, it is comparatively easy for Trump to reverse tighter Federal regulations on electric (mostly coal) power plants, meant to promote cleaner alternatives (renewables and natural gas). And due to its symbolic importance, welching on the CPP might provide cover for other nations to back out of the Paris Accords. When you actually look at the numbers, the Clean Power Plan (or CPP) turns out to have a pretty modest forecast impact on US greenhouse gas emissions. Its reductions more or less neutralize the GDP-driven GHG increases forecast by the US State Department. Indeed, the CPP is but a fraction of Obama's raft of climate-responsive policies. For example, his boring but toothy updates to energy efficiency codes and standards are likely to have a much greater impact than the splashy CPP, and are much harder (or at least more brain damaging) to undo. 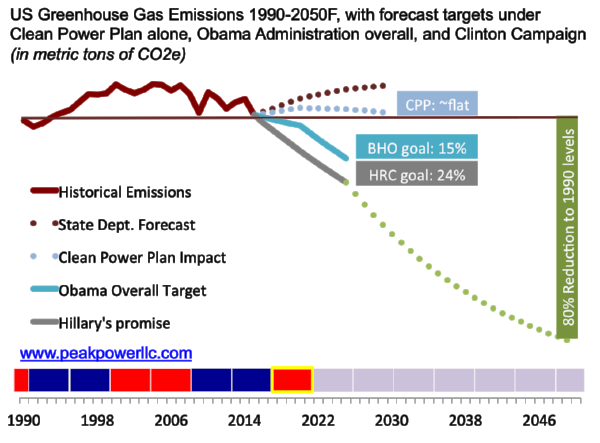 A second observation is about time: both Obama and the erstwhile Clinton campaign's emissions reduction goals depend on trend acceleration well beyond their terms in office. In order to hit the oft quoted IPCC target of an 80% reduction to 1990 levels, trends would have to accelerate even harder past those presidential promises (the green dotted line above). To some extent, this acceleration makes sense-- in the dramatic cost curves for solar, wind, batteries, and LED lights, one can see that "going green" is requiring fewer and fewer tradeoffs; more experience using and integrating these technologies also mean less and less adoption risk. But in another sense, expecting climate policy to go in just one direction-- at least so long as climate action is denied and demonized on the right-- is an absurd assumption. The Dems were always going to lose an election (or four) between now and 2050. Also notable that the biggest emissions rise since 1990 was actually under Clinton I-- the first 2 blue bars along the bottom of the chart. The bottom line is: we cannot rely on Executive action alone to bend the arc of our national emissions (and by extension, probably no masterstroke global treaty-- carbon tax or otherwise-- either). Climate change must become a bipartisan issue, felled by a thousand cuts, or we ain't gonna get there. Balancing FERC's pro-markets imperatives with clean energy enablement, esp. Incumbent independent power producers (IPPs) tilting capacity and reliability rules to extract rents, both generally and as a counter to growing wind, solar, and demand-side resources. See, eg, FERC Chairman Bay's dissent re: PJM's peculiar capacity incentives. Let's say Trump rolls back Obama's EPA methane rulemaking, and does nothing as powerful IPPs batten on esoteric electric markets, Even here, there are things we can do. We, as consumers, can push utilities and ESCOs and corporate consumers to ensure the integrity of upstream natural gas extraction (if it works for organic kale...). Less fluffily, Trump's stated commitment to infrastructure might include transmission lines, which would do plenty for renewable energy integration. Finally, some worst-case cronyism for the IPPs would surely extend to their nuclear holdings, at least preserving this carbon-free generation in the mix. Clinton II would have continued Obama's march toward strong efficiency standards and renewable deployment, allowing a more measured pace to the 2050 IPCC goal. Yet any of the key but arcane issues above might have fallen through her Administration's cracks. And in the case of increasingly powerful post-PUHCA utilities and power companies, let's face it: Hillary was never going to be a trust-buster. Even as we organize politically for 2018 and 2020, states, markets, civil society, and consumers still have meaningful-- and ultimately more impactful-- hands to play: setting targets, sending market signals, and forging public consensus. Technological innovation is doing much of the work on the supply side, while state renewable portfolio (and EE) standards drive up demand. Behind the conservative bluster, bipartisan public opinion is unmistakably shifting toward acting on climate. Whoever is president, the work must continue. Over this morning's coffee I watched some of a youtube'd speech by regulatory economics legend Paul Joskow, in which he addresses energy solutions to climate change. The remarks wholeheartedly support a carbon price—in Joskow’s words, “letting the rat smell the cheese:” creating incentives to broadly temper energy production and consumption decisions. In turn, Joskow warns against strictly prescribed government solutions to climate change, noting our national humiliations in coal gasification, nuclear waste disposal, cold fusion, etc. The comments were made just a couple years ago, but a carbon price is probably no longer on the US political table: HRC’s platform, for example, makes no mention of it. The pursuit of a lid on carbon has gone upstream—as Obama’s Clean Power Plan narrowly targets big power generation—and more fundamentally to the individual states, including our own New York. At first blush, New York would appear to be a strong adherent to Joskow’s “smell the cheese” approach. In particular, Cuomo’s signature utility policy, REV, attempts to break delivered electricity down into its component price signals (their “LMP+D+E” formulation), whose price of carbon (E) builds on the state’s Pataki-era entry into a milder multistate carbon market (RGGI). In a different light, however, we are very much indebted to well-picked winners. New York has the lowest per capita energy-related CO2 emissions of any state. While some of this is certainly due to the past decade’s investment in energy efficiency, it is more certainly due to big government choices, aided massively by geography. Take New York City: built on a series of islands before the advent of the automobile, the original megacity is doubtless conducive to superefficient population density; but without our world-leading public transit infrastructure, we would be using many more cars to get around. This same is true, to an even greater extent, in our energy supply. Some 50% of our in-state generation (71 of 142 terawatt-hours) is green, driven by just a handful of nuclear and hydroelectric plants. Our hydro—the vast majority at 2 plants, Niagara and St. Lawrence—was envisioned by Governors Theodore Roosevelt and Al Smith over a century ago; operationalized by Governor Franklin D in 1931; and took more than 20 years to build (by Robert Moses, under Governor Dewey) in the 1950s. Our nuclear was no market accident either: just 4 plants (3 on Lake Ontario, plus the much-maligned Indian Point) were imagined and winner-picked during the Rockefeller Administration in the 1960s. Behind the rhetoric, there is winner-picking going on in Cuomo’s REV as well. The NY-SUN program, for example, sets explicit targets for rooftop PV installation, largely agnostic to the relative cost and benefit of these sources (as compared to say efficiency or utility-scale land-based wind). Despite costing significantly more than other resources, the Administration has carefully developed a case for Offshore Wind. Along these lines, look out for aggressive electrochemical battery incentives / procurement targets at the end of this year. Perhaps most strikingly, the Cuomo Administration has opted to directly subsidize those Rockefeller-era nuclear plants: a reasonable short-term fix that does not solve the problem of replacing them when the increasingly uneconomic majority of the nukes reach end-of-life (around 2030). New York has certainly made big mistakes in picking big winners, to wit the doomed Shoreham nuclear plant on Long Island, which forced LILCo’s reverse-privatization (to LIPA) under Cuomo I. Whether Cuomo II’s picks will bear fruit of course remains an open question, too. I’d guess that price signals, if well-implemented (i.e. not gamed by insiders—a big if! ), are the better option, in that we are not so beholden to a handful of big bets. Joskow is certainly thinking of the brilliant performance of price signals in handling acid rain in the 90s (nor am I sure he’d disagree with me here?). But in general, New York State owes most of its climate assets to winner-picking. In the current political environment—and despite REV's rhetoric—it is worth remembering the historical merits of big bets on infrastructure projects. When Boris Johnson, Nigel Farage and the good people of Great Britain made the move to leave the EU, investors around the world headed for safety. What this meant in large terms is government bonds, particularly (1) Germany--which has a negative all-in bond yield-- and (2) the United States, whose 10-year bond yield is now below 1.4%, and, after accounting for inflation, have flipped negative, too. This implies that if these governments were to borrow more (i.e. issue bonds), the interest they'd have to pay thereon would be unprecedentedly inexpensive. The same downward trend is evident for municipal bonds, the more-frequent engines of public infrastructure investment in the US (see chart below left). New York State's municipal bond valuations are no exception to this rule (see chart below right; bond price is the inverse of the yield, so a rising price means a lower yield). What does this have to do with New York's energy policy, you ask? While Regulatory (aka "little" or lil') REV is primarily about market animation and private-sector investment in distributed energy resources (DER), Clean energy (aka "big") REV is about capturing and eliminating a harmful negative externality (greenhouse gas emissions) via cost-effective, source-agnostic investment. Big REV hopes to create both a sustainable state system and an emulable global example of a megacity, its suburbs, and countryside with carbon-free electricity. In other words, not just doing our share, but increasing the odds of NY's economic and ecological survival. There is a strong pattern in lil' REV of reducing and deferring public and utility spending: the BQDM program directs Con Edison to spend $400MM on DER over the next 2 years in order to defer a $1bn substation investment; NYSERDA is eliminating "resource acquisition", i.e. conventional incentives, for energy efficiency over the next three years; and market-driven (i.e. primarily Federal and privately-funded) distributed resources-- rooftop solar-- will carry the near-term weight in terms of our clean energy transition, at least by megawatts. What's less emphasized is the extent to which we can redirect this liberated funding capacity immediately to G&T-scale infrastructure, and perhaps even ramp it up in the context of historically cheap borrowing costs. The idea is to make low-carbon hay (i.e. solar and wind installations) while the financial sun (Brexit-induced bond appetite) is shining. Transmission and utility-scale generation planning, procurement, and installation is time consuming, and folks are working through it. From the political perspective, overemphasizing the value of market upswings can create a thorny situation should the situation reverse. But, if we can get there in time, Brexit and the international flight to financial safety offers an unexpected tailwind for NY's (and America's) clean energy transition. Nevada: NV Energy, MGM and "Leaving the Grid"
Cross-posting a comment/letter I made on a story that gets at the core of Peak Power LLC's work merging DER and renewables into the utility grid. Greentech Media's excellent Energy Gang podcast featured a segment last week about a large commercial customer (MGM) deciding to directly procure its own renewable power, rather than buying from the utility, Nevada Power. The Gang calls MGM's move "leaving the grid", or leaving Nevada Power, full stop; they suggest it may be the start of the utility death spiral. At one point renewable energy pioneer and personal hero Jigar Shah seems to suggest MGM's move is something between karma and empirical refutation of NV Energy's recent retrade on solar net energy metering (NEM)-- here is a sophisticated customer willing to pay a premium to unplug from the grid! The segment's portrayal of MGM's move had me questioning a lot of what I thought I knew about distributed (or community-style) renewables vs. centralized generation: i.e., that a building is rarely and island, and it is hard to replicate the grid's diversity benefits of being connected to a large network of users and suppliers. It turns out that the reality is a lot less dire or monumental than the segment, at least to me, implied. An NV Energy statement (widely reported) unambiguously states, "[the utility] will continue to work with MGM to meet their needs as a transmission and distribution customer of NV Energy”. So MGM is not defecting from the grid after all! In this light, the MGM move has nothing to do with net energy metering, nor is it evidence of commercially viable grid defection. It more closely resembles an argument for 90s-style deregulation--of generation. This is a large customer cancelling its subscription to NV Energy's vertically-integrated / "triple play" offering, but very much maintaining the utility's core grid services. MGM is screwing the rest of the rate base with uncompetitive plants, and perhaps forcing hard regulatory decisions-- stranding uneconomic generating assets vs. rate hikes and, yes, the risk of a death spiral. MGM's continued reliance on utility T&D infrastructure in a formal tariff structure is a crucial detail that the story somewhat irresponsibly omits. REV Order Resetting Retail Energy Markets - a Missed Opportunity? A post in Monday’s New York Times observed that societal problems almost never require a novel solution. The bottleneck is usually distribution—getting proven fixes (like malaria nets) to the folks in need. In its 23 Feb Order Resetting Retail Electric Markets, the New York Public Service Commission may have missed a great opportunity at both ends of this paradigm: taking an existing, effective (if abused) solution for engaging energy consumers-- the ESCO salesforce--and repurposing it to accelerate the deployment of distributed energy resources (DER). In case you missed it, the Order blocks electric and gas commodity retailers (known as ESCOs) from signing new procurement contracts with residential and small commercial users (the “mass market”), unless the ESCO (a) guarantees savings versus the utility procurement or (b) procures at least 30% of the electricity from renewable resources. The Order’s basic logic—that ESCOs can’t beat utility procurement for these smaller consumers, and are thus likely in the bilking business—makes sense. The renewable energy carve-out, insofar as it vaguely ascribes value to low-carbon power, helps advance the Governor’s goal of 50% renewables by 2030. Isn’t this an “animated market”? Why not? How would the hoped-for legions of battery and demand response (and, for that matter, 30% renewable energy) salesmen protect consumers where the old retail market failed? Will “information” really transform mass-market consumers into rational market actors? It’s true, many of these lessons are negative (and politically unhelpful). But there may be some positive ones as well. The ur-goal of REV is to unlock DER in addressing reliability, affordability, access, and sustainability in the electric power system. ESCOs have demonstrated an ability to overcome a primary barrier to distributing DER solutions—making customers care enough about energy to change their purchasing behavior. I was recently talking with an executive in the retail ESCO industry. He observed that, despite deep customer relationships and pent-up societal benefit in cross-selling DER, ESCOs have limited incentive to cross-sell onsite energy resources (efficiency, solar, CHP) and thereby jeopardize annual commodity sales. This retail market reset is a perfect opportunity to reverse perverse ESCO incentives. Why not explicitly make energy efficiency or onsite renewables (hopefully with appropriate anti-predatory protections) count toward the 30% clean energy carve-out, or the cost savings guarantee (as so promisingly offered by Sealed)? To be fair, the Order does gesture toward “[expanded] opportunities for vendors to develop and provide services to residential and small non-residential customers” via other REV processes. But salesmen need to eat, and the cause for waiting is not clear. By bifurcating these efforts in the retail mass market, the Commission may have missed a nice opportunity to learn from past mistakes and use existing resources to advance a central REV objective. An article I wrote about the recently concluded NYPSC et al v. NYISO case, regarding demand response participation in wholesale capacity markets, is online at Greentech Media here. The big question for me and Peak Power is: how do you shift the discussion on demand response past largely hollow "free markets forever" rhetoric and actually encourage investment in demand-shifting and other behind-the-meter resources, especially when utilities and power producers have a lot more information and control of the system than the decentralized alternatives? The article gets at a particularly egregious interpretation of market rules by FERC to protect conventional power incumbents, but I think there's a lot more that can be done: state regulatory policy and incentives, NYISO rules, and especially longer-term building owner approaches toward grid optimization. All of these elements loop back to battery storage, AMI, the true cost of solar, and efficient use of public funds to transition the grid. Hopefully this is a way to call attention to that broader effort. Thanks to Stephen Lacey and Eric Wesoff at GTM for the airtime, and all the folks who read drafts of this thing (Joe Goldstein, Nick Lombardi, Evan Berger in particular). Demand Response (DR) is typically pitched as “free money”: a cash payment to the Building Owner that requires little or no investment on their part. A mere 1-year payback sets a common upper bound for project cost, per current market practice. Few economically feasible DR assets: DR is basically limited to turning things off (can annoy tenants) or running uncontrolled, dirty emergency generators (bad for New Yorkers). No plannability: Owners are noncommittal about staying in DR, so it's hard for utility planners to bank on it as a resource--a problem when the whole point is to defer long-term capital investment! No leverage: With investment at a 1x multiple of DR payments, Public incentives for DR (whether upfront or recurring) are ineffective at leveraging-in private capital. Reason #3 gets at the crux of the issue: increasing monthly payments (or incentives of any kind) has limited impact on investment in DR. Adding $1 to monthly DR payments may convince an Owner to invest just $0.80 more upfront (accounting for the ongoing costs of DR enrollment). Owners currently look at DR as a current year, "free money" proposition. In order to spur real investment in DR, the paradigm must shift to long-term investment, valuing payments over 10+ years. By capitalizing DR payments over a 10-year horizon at a reasonable, risk-adjusted discount rate, every $1 of DR payment gets leveraged closer to 6-8x (of course, subject to asset-specific operating costs): adding $1 to DR payments would yield $7+ in private sector investment! By applying a 15% discount rate to 10 years of DR payments, investment amounts grow to nine times the current status quo; this effect creates far more leverage than merely increasing rates. NYC's utility Con Edison seems to understand the importance of moving beyond the current "free money" value proposition of DR: in 2014, they doubled DR rates and added a triennial "Retention Bonus"; they also offered to pay Owners half the cost of any DR-enablement investment as part of the Indian Point-triggered DMP. But unless investors and Owners approach DR as a true multi-year investment, these increased payments-- which get passed through to everyone's electric bill-- have a limited yield. Peak Power seeks to supply a framework and investment capital for this market transformation, to usher in a new era of affordable, plentiful, durable, peak-flattening Demand Response for New York's electric grid. New York State is making a concerted push to recognize, adapt to, and encourage a new era for the electric grid: the age of the Distributed Energy Resource (DER, sometimes pronounced 'durrh'). The core of this new policy is a plan and process by the state utility regulator (NY PSC) called Reforming the Energy Vision, or REV. A driving theme in REV is to "animate markets", i.e. encourage broad-based participation in balancing electric supply and demand through many individuals and projects (i.e. DER), rather than trying to force specific, top-down solutions via regulated utility investment or prescribed state incentives. "DER" is used to describe a wide variety of distributed energy resources, including end-use energy efficiency, demand response, distributed storage, and distributed generation. DER will principally be located on customer premises, but may also be located on distribution system facilities. So DER means rooftop solar, and also ice thermal storage, and also LED retrofits; the PSC is not trying to define what one does or looks like. At the same time, I believe there are clear signals from the building, grid, and societal level that indicate the desired characteristics of the Perfect DER. I put these in 4 buckets:. I'll get into greater detail here in 2 future notes. Peak Demand in New York City: What's the problem? Electricity typically gets to your home or office through a massive central system, aka the Grid, broken into three basic components: generation (mostly power plants sited outside the City), transmission lines carrying that power over long distances, and local distribution (stations and wires) to condition and deliver the power. From an infrastructure planning perspective, the total amount of electricity consumed (kilowatt-hours or kWh) is important, but perhaps more meaningful is the rate of consumption (think of the water pressure in your shower), and the volume of the pipes to support this flow. This energy "bandwidth" is measured in kilowatts or megawatts (kW or MW). The maximum rate of consumption from the centralized electric grid is called Peak Demand. Peak Demand usually occurs on hot days in the summer, when building air conditioners are running full blast. How Bad is NYC's Peak Demand? 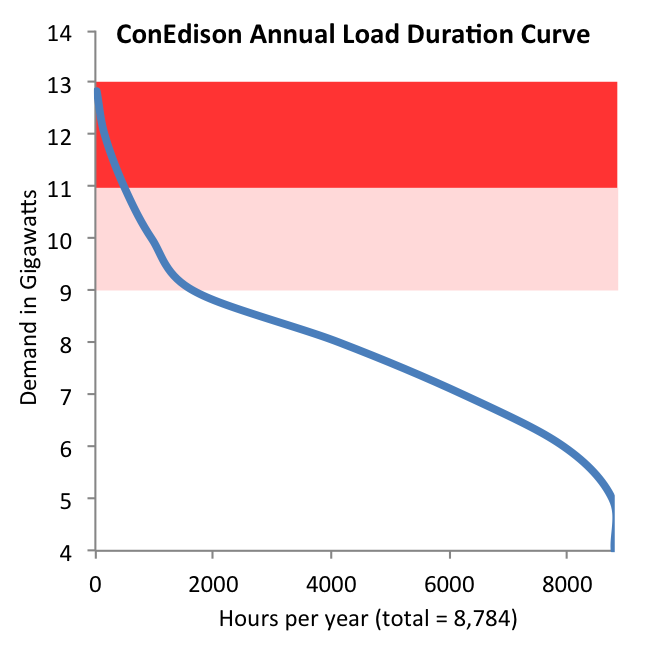 The chart below shows the load duration curve for Con Edison (CECONY), which serves NYC and parts of Westchester. At the upper left corner of the curve is ConEdison's peak demand: about 13 gigawatts (or 130 million old-school 100W lightbulbs, if that helps). Notice that the curve is steeper at the left, then flattens out as it moves right (i.e. the load duration gets longer). The problem with peak demand is this steepness: the top 2 gigawatts, 15% of total demand--run less than 7 days per year, or less than 2% of the time. This gets expensive: transmission and distribution costs up to $840 per kW per year. The NYS PSC's REV recently estimated that cutting the top 100 hours of peak demand could save New York State up to $1.7 billion a year. ConEd 2012 load duration data; note CECONY overlaps Westchester Cty, but is mostly New York City. Like other capital-intensive endeavors, the electric grid is made possible by volume. This immense, expensive and resource-intensive infrastructure is worthwhile if it's in use say, the 2,000 "regular" working hours in a year (or better yet 24-7), because fixed infrastructure costs can be spread over more hours. By contrast, high peak demand means the capacity gets spread over fewer, very expensive hours. Clipping peak demand reduces capacity requirements for the electric grid, which would ease the financial burden on utility rate payers, taxpayers, and future generations of New Yorkers seeking economic competitiveness. It could also help preserve our open space by reducing the need for new transmission lines. Unfortunately (see chart below) experts forecast peak demand to keep rising. Through a combination of energy efficiency, slowing population growth, and perhaps things like rooftop solar, average demand (total demand / annual hours) will stay flat or even slightly decline over the next 10 years. Peak demand, on the other hand, will continue to rise. Structural changes to the economy (more office workers on the same work-home schedule, for example), and the increased preference for climate controlled environments, are driving peak demand higher in New York City and other grids across the country. The quick-and-dirty metric for demand "peakiness" (or inversely, grid efficiency) is called utilization factor: the ratio of average over peak. In NYC, utilization goes from ~60% in 2004 to ~45% in the 2024 forecast, a costly 25% reduction in efficiency. The supply-demand picture could be rendered even more troublesome by the increased penetration of intermittent renewables and the potential shut-down of large baseload power plants like Indian Point and Danskammer. NYISO: NYC peak and average annual demand, 2004 - 2024F. What Peak Power LLC is doing about it. The problem is clear: peak demand in NYC ought to be slashed, on the order of gigawatts, asap. Efficiency, behavioral, and mechanical tweaks won't get us there; creating alternative, clean sources of peak power at NYC's major load centers (read: big buildings) will. Stay tuned here, or better yet contact us to learn more! Please check back here for more posts on the markets, projects and policy issues we are working on at Peak Power. 'Til then, feel free to browse our site or contact us.